Poverty is a multidimensional phenomenon involving things other than consumption — such as access to and quality of health and education, housing, possession of durable goods, freedom, and many other factors. The consumption and multidimensional poverty approaches are complementary: it is possible for example that a family has consumption levels below the poverty line but lives in a good quality home, its members have a good level of education, and vice versa. 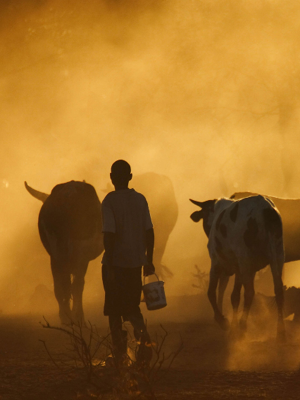 Until now poverty assessments in Mozambique only presented consumption poverty estimates and trends, which are quite volatile and greatly affected by short-term shocks. For the first time since poverty evaluation started in Mozambique in 1996/97, the Fourth National Assessment of Poverty and Wellbeing in Mozambique 2014/15 presents estimates of multidimensional poverty and its evolution over time. The aggregation of the indicators is done using the method of Alkire-Foster (A-F), one of the most used internationally. To estimate multidimensional poverty using the A-F method, it is necessary to choose a poverty threshold or cut-off, which is the (weighted) proportion of deprivation sufficient to identify a household as living in poverty. In this Assessment, households that are deprived in at least four of the six chosen indicators are considered living in poverty from the multidimensional point of view. At the level of individual indicators of multidimensional poverty the results show a reduction in the level of deprivation over the period 1996/97-2014/15 for all indicators. However, there is a difference inthe rate of reduction among the analysed indicators: education stands out among the indicators of rapid growth followed by access to safe water. At the same time, a large part of the Mozambican population is still deprived with respect to housing conditions indicators, such as access to quality sanitation, electricity and durable goods, especially in rural areas. Figure 1 shows the results of the poverty incidence (H) at national, urban/rural, and provincial levels. A large reduction is observed over time, which suggests that the proportion of the population that is living in poverty from the multidimensional point of view has decreased substantially. The map highlights the high poverty levels in the central and northern provinces, much higher than those in the south-central provinces. Another result to be highlighted is related to the number of deprivations suffered: at national level the proportion of the Mozambican population deprived in all six indicators fell from 47% to 14% between 1996/97 and 2014/15. At the same time the percentage of individuals not deprived in any indicator rose from 2% to 16%. The increase was particularly significant in urban areas, where the percentage of individuals not deprived in any indicator rose to 46% of the urban population. However, the proportion of individuals deprived in all dimensions is still substantial in rural areas (20%); (21% in the northern, and 16% in the central provinces). 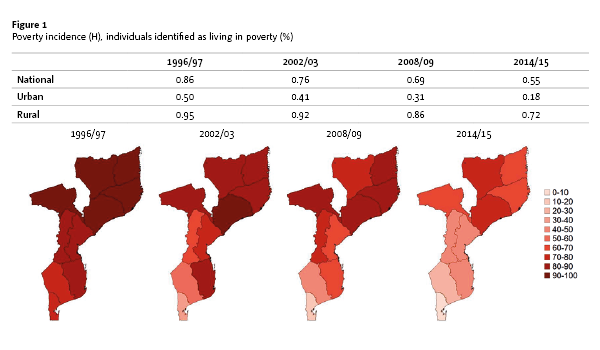 Overall, multidimensional poverty declined substantially in Mozambique between 1996/97 and 2014/15, with somewhat slower progress over the period 2002/03 to 2008/09, but there are still very large differences between urban and rural areas and between provinces. This tends to reinforce the conclusion of unbalanced growth: the five central-north provinces (Niassa, Cabo Delgado, Nampula, Zambézia, Tete) are consistently more deprived from the multidimensional point of view in all surveys. This Policy Brief, also available in Portuguese (disponível en Português), draws on Mozambique’s Fourth National Poverty Assessment.